Dockers manually manoeuvre lighters at Tilbury Docks, where several steamships are moored. The opening of Tilbury in 1886 moved the Port of London further downriver. They were not initially successful but as ships grew ever larger Tilbury found itself as the only docks in the port capable of handling the largest vessels. The major London docks of the early 19th century were created for sailing ships. Their developers could not foresee that within a few decades steam-powered, iron-hulled vessels would be built so large they were unable to enter those docks. The result was that massive new basins were opened further downriver as the Port of London moved eastwards. There was a period of rapid expansion of the Port in the early 19th century in which the West India, London and East India Docks were opened on the north bank of the Thames at the Isle of Dogs, Wapping and Blackwall respectively. South of the river a large patchwork of docks, and ponds for floating timber was created by several companies on the Rotherhithe peninsula. That first new dock boom ended with the opening of St.Katharine’s near the Tower of London in 1828. The growth of Britain’s economy and an overseas empire ensured that manufacturing in London and beyond continued to increase and that the growing wealth of individuals created greater demand for consumer goods. Raw materials were required and exports of manufactured goods could be sold around the world. A significant cargo was coal, brought down the coast from the North East of England. The new docks of the early 19th century, as well as the many riverside wharves, provided the facilities that ensured that much of that traffic passed through the Port of London. Intense competition between the individual dock companies and wharves had reduced the business at the West India Docks, which relied heavily on income from warehousing. The East India Company lost its monopoly on trade with India in 1813 and with China in 1833 and no longer traded with its own fleet of ships as they had for the previous two centuries. To ensure their survival the East and West India Dock Companies agreed to merge in 1838, authorized in one of the first Acts of Parliament approved by the new Queen Victoria. Sailing ships had to travel according to seasons, when the winds were blowing in the necessary direction to propel them across the Atlantic, or around Africa on their journey from the Far East. The introduction of iron-hulled steam engines with propellers allowed ships to navigate whatever the wind, reducing the voyage from New Zealand from four months to eight weeks. They revolutionized shipping during the second half of the 19th century and had a major impact on the Port of London. Iron hulls allowed vessels to be bigger and thus carry more cargo and be more cost-effective. Nevertheless the introduction of steam and iron did not happen overnight and it took time for such craft to prove their reliability. Coaling stations had to be established and supplied at points around the world before long-distance voyages were possible. It was only in the 1880s that British-registered steam tonnage exceeded that of sail. By the mid-century new ships were being built that were already too big to navigate as far along the Thames as the upper docks. Nor were they able to enter through the relatively small locks into any of the existing docks, which were anyway too shallow to receive them. Furthermore the original docks were hemmed-in and unable to easily expand for railway sidings. If London was to continue to survive and grow as a port it needed new docks or wharves for the steam age of the second half of the 19th century. A group of developers therefore obtained an Act of Parliament in 1850 to create a new enclosed dock to accommodate these larger vessels, with a larger entrance lock and basin than its predecessors. The new Victoria Dock was at Plaistow Marshes, east of Bow Creek, further downstream than the others. 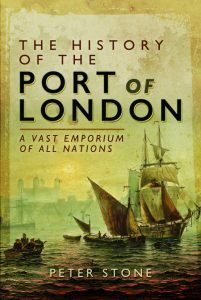 Being so remote from London had been a problem when the East and West India docks had been created fifty years earlier. The new dock was the first to be linked to the rest of the country by railway so that not an issue in its case. The previous docks had been established by merchants and ship-owners, whereas the men behind the Victoria Dock were civil engineers with experience of building railways. Being marshland, remote from London and with little purpose until that time, the developers were able to purchase the land cheaply. Much of the time it had been below water-level and flooded but that made excavation easier for the purposes of creating a basin. The new dock had a half a mile of quay on each side of its vast single basin. Railway tracks were laid alongside both sides so that cargo could be loaded directly from ships into goods wagons, to be taken into the dock storage sheds or out onto the national railway system. On the north quay were the company offices, with tobacco warehouses, wine vaults and coal sidings. Storage for other types of goods such as salt, jute and guano stood on the opposite quay. The dock’s huge entrance lock with hydraulic gates was seventy per cent larger than the nearby East and West India Docks. The Victoria Dock was opened by Prince Albert in 1855.